If God is who he says he is and can indeed do what he says he can do, why are so many Christians living mediocre lives? 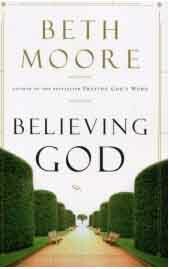 Beth Moore thinks that there is a simple answer to this question: unbelief. Therefore, in Believing God she challenges us to take God at his word, believe his promises and, as a result, live fuller lives. Dont be afraid to set aside your unbelief and experience the great blessings of God promises.